Named after its sponsor, the telecommunications company Verizon Communications, the Verizon Center has been nicknamed the "Phone Booth" by local fans, because of its historical association with various telecommunications companies, such as MCI Inc. and Verizon. Located in the Chinatown neighborhood of Washington, D.C., the Verizon Center sits atop the Gallery Place rapid transit station of the Washington Metro. The Verizon Center is home to the Washington Mystics of the Women's National Basketball Association (WNBA), the Washington International Horse Show and was formerly the home of the Washington Power of the National Lacrosse League (NLL) from 2001 to 2002. The arena's seating capacity is 20,308 for basketball and 18,506 for ice hockey. The Verizon Center is owned by Monumental Sports & Entertainment and is situated on top of land leased from the District of Columbia. The Verizon Center was built in the mid-1990s solely with private financing and was originally owned by Abe Pollin from 1997 to June 2010. On June 10, 2010, following Pollin's death in November 2009, the Pollin family sold Verizon Center, along with the Washington Wizards and the Washington-Baltimore area Ticketmaster franchise, to Ted Leonsis, who already owned the arena's other tenant, the Washington Capitals. Leonsis subsequently formed a new management company—Monumental Sports & Entertainment. The Verizon Center is largely considered to be a commercial success and is regarded as one of the driving catalysts of the revitalization (and gentrification) of Washington, D.C.,'s Chinatown neighborhood. A report emerged in May 2015 that Verizon would not renew its naming rights to the Verizon Center when its agreement with Monumental ends in 2017. In the same week, it was announced that Etihad Airways signed a deal to become the official airline of the arena, sparking speculation that Etihad might be the leading contender to assume naming rights in 2017. The Verizon Center, located in the Washington, D.C. neighborhood of Chinatown, originally opened on December 2, 1997, as the MCI Center, named after its sponsor, MCI Inc. Nearly a decade later, in January 2006, Verizon Communications purchased MCI Inc. and the arena's name was changed accordingly. The following year, in 2007, the "first true indoor high-definition LED scoreboard" was installed at the Verizon Center. 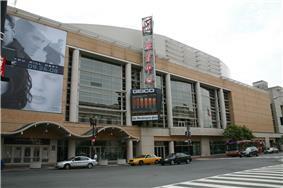 On December 2, 2007, the Verizon Center celebrated the ten year anniversary of its opening. In December 2013, all electronic communications to and from the scoreboard and advertising fasciae were updated by ColosseoEAS. 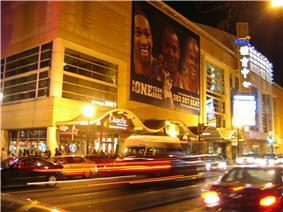 Verizon Center, then known as MCI Center, on game night (the Wizards vs. the Hornets), January 20, 2006. 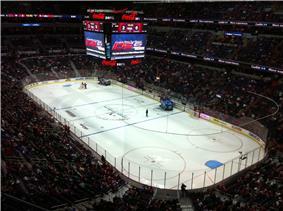 Washington Capitals game on February 1, 2011, featuring the Verizon Center markings on the ice surface. The Washington Wizards in an NBA game against the Cleveland Cavaliers, December 5, 2007. 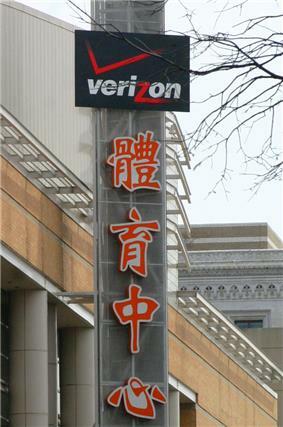 Verizon Center is located in the Chinatown neighborhood. ACC men's basketball tournament: 2005, 2016. The Archdiocese of Washington Youth Rally and "Mass for Life": Every January, from 2004 to present. Pink entertained a sold-out crowd at the Verizon Center on March 14, 2013, showcasing her 2012 album The Truth About Love. November 4, 2014: Alexander Ovechkin passed Peter Bondra as the Washington Capitals' all-time scoring leader in a regular season game between the Capitals and the Calgary Flames. Calgary won the game in overtime, 4-3. At the start of the 2010–11 NHL season, Verizon Center food partners Aramark and Levy joined the Washington Capitals in a NHL-wide food donation program called Rock & Wrap It Up. The program has since been extended to all events at the arena. With this program, almost all food that is prepared for games and events that goes unused is donated to DC Central Kitchen. On February 10, 2012, the Washington Capitals hosted the third-annual Caps Care Casino Night and Auction. Over 600 fans turned out for the sold-out event, playing casino games to earn raffle tickets, snacking, dancing and participating in live and silent auctions, with proceeds benefiting the Children’s Hospital Foundation, Love for Lokomotiv and Washington Capitals Charities. The event raised a total of $353,851 for the various charities. During the 2012–13 NHL season, the Capitals Courage Caps program raised more than $105,000 for the Tragedy Assistance Program for Survivors (TAPS). Since the program began during the 2007–08 season, the Courage Caps campaign has set a new record for giving each year. By the end of the 2012–13 season, a total of nearly $350,000 was given to TAPS through the program. Monumental Sports & Entertainment Foundation donated $10,000 to the NHL's Thurgood Marshall College Fund at the Congressional Hockey Caucus Briefing on Capitol Hill on April 24, 2013. This academic scholarship is part of the partnership between the NHL and the Thurgood Marshall College Fund for participants in the NHL's Hockey is for Everyone (HIFE) initiative, the League’s official youth development program. During the 2013–14 school year, 20 staff members from Monumental Sports & Entertainment participated in the Everybody Wins! DC Power Lunch program, a literacy and mentoring program based in select elementary schools in the Washington metropolitan area. Each week during the school year, MSE staff members took time out of their days to visit with their mentees, spending time reading and conversing during lunch. In October 2013, Washington Capitals defenseman Nate Schmidt, alumnus Paul Mulvey and mascot Slapshot participated in the Playworks Washington, D.C., Hockey Extravaganza at J. O. Wilson Elementary School. The extravaganza served as the launch for the Playworks co-ed street hockey league, a pilot program with students from Arts and Technology Academy Public Charter School, Bruce Monroe Elementary School, Smothers Elementary School, West Education Campus, and J.O. Wilson Elementary School. The Washington Capitals raised $39,521 for the Leukemia & Lymphoma Society’s National Capital Area Chapter during the team’s Hockey Fights Cancer Night on October 19, 2013, by auctioning off autographed jerseys that the players wore during pregame warmups. In October 2013, the Washington Capitals partnered with Homeward Trails Animal Rescue to create the 2014 Capitals Canine Calendar. Homeward Trails is a nonprofit 501(c)(3) organization that provides pet adoption in Virginia, Washington, D.C., and Maryland. The calendar, which went on sale December 3, 2013, features photos of Capitals players with their dogs as well as dogs from Homeward Trails. All proceeds went to benefit Homeward Trails. The previous Capitals Canine Calendar raised $30,000 for the Washington Animal Rescue League. On November 7, 2013, the Washington Wizards hosted wounded warriors from Walter Reed National Military Medical Center as well as families from Tragedy Assistance Program for Survivors (TAPS) at Verizon Center. The visit was part of the launch of Monumental Sports & Entertainment Foundation’s Wizards Courage Program. Monumental Sports & Entertainment partnered with NBC4 for the Food 4 Families food drive, held on November 25, 2013, outside Verizon Center. Fans were encouraged to drop off non-perishable canned goods or make monetary donations in order to help families in need in the D.C. area at Thanksgiving. In December 2013, Monumental Sports & Entertainment Foundation and Hoops for Youth Foundation collaborated to provide a new outdoor basketball court for Horton’s Kids. Horton’s Kids is a local nonprofit that provides education and enrichment programs to young people in D.C.’s Ward 8. Monumental Sports & Entertainment Foundation’s Family-to-Family program took place in December 2013. Capitals players Nicklas Bäckström, Eric Fehr, Mike Green, Steve Oleksy and Joel Ward; Wizards players Trevor Ariza, Trevor Booker, Nenê, John Wall; and Martell Webster; and Mystics coach Mike Thibault delivered gifts to four underserved families in Washington, D.C.
Monumental Sports & Entertainment Foundation received the inaugural Corporate Engagement Award as part of the 2013 Mayor’s Community Service Awards on December 17, 2013. The Mayor's Community Service Awards are presented annually to recognize, reward and encourage activities that make or have a significant impact on meeting the needs of District of Columbia communities. The Washington Capitals and Braden Holtby partnered with the Children's Wish Foundation of Canada to grant the wish of 8-year-old Braden Nienaber to meet the Capitals' goaltender and other Capitals players from January 11–12, 2014. Washington Bullets alumnus Bob Dandridge, Capitals Hall-of-Famer Rod Langway and Washington, D.C., Mayor Vincent C. Gray participated in a MLK Day of Service project hosted by Monumental Sports & Entertainment Foundation and Playworks Washington, D.C., at West Education Campus in northwest D.C. on January 20, 2014. Two notable fan fixtures at Washington Capitals games at Verizon Center since the late 1990s include Goat and The Horn Guy. "Goat," a.k.a. William Stilwell, sits in Section 105 and loudly stomps and starts cheers for the team, with his loud voice that The Washington Post once called "the loudest voice and stompiest stomp on F Street." "The Horn Guy," a.k.a. Sam Wolk, sits in section 415 and blows out three blasts on a horn to which the arena responds "Let's Go Caps!," a chant that can be heard during all radio and TV broadcasts. In August 2010, ESPN's Outside the lines segment reported that the Verizon Center was one of only two major sports arenas in the U.S., and the only in the NBA/NHL, in which 100% of food vendors were found with at least one "critical or major" health code violation. Violations included mice droppings in at least ten different vending locations. When the arena opened there was concern that it would lead to the displacement of Chinese businesses and culture  in the area that is the city's Chinatown. The surrounding area has indeed been dramatically gentrified, and most of the Chinese residents and businesses who lived and operated in the neighborhood when the arena first opened have been displaced because of the spike in real estate prices. The Chinese population in Chinatown is a ghost of its former self—recent estimates hold that the number of Chinese in the neighborhood is down to around 400 to 500. The Chinese-owned restaurants and businesses in the Chinatown area are largely gone and there has not been a full-service Chinese grocery in the neighborhood since 2005. In their place, new residents and visitors to the area find an increasing number of mid-tier and upscale chains, such as Hooters, Fuddruckers and Legal Sea Foods. In December 2007, then-Capitals captain Chris Clark gained a bit of press by stating that he believed the Verizon Center had the worst ice in the NHL. "There's a lot of ruts in the ice. It's soft. It's wet half the time. I could see a lot of injuries coming from the ice there. It could cost [players] their jobs... Even guys on other teams say the same thing. When we're facing off, they say, 'How do you guys play on this?'" Capitals owner Ted Leonsis addressed this criticism directly. The ice quality issue has been persistent both since the opening of Verizon Center and with the Capitals franchise in general. Since Leonsis' acquisition of Verizon Center, the quality of the ice has gotten better and number of complaints has noticeably decreased. During playoff games, the arena installs a system to help remove hot air and humidity to maintain the ice conditions during warmer times of the year. The "Washington Mystics Attendance Champions" banners that hung at the Verizon Center had been the focal point of much criticism over the years, with many people believing that the rafters should be reserved for achievements by sports teams and not by the fans. Critics thought it was insulting to have banners for championships and retired numbers hang next to "attendance champion" banners. Originally there were six banners (1998, 1999, 2000, 2002, 2003, and 2004); the number was later reduced to three in 2007 (for the first two seasons plus 2002, the only season in which the Mystics have won a playoff series to date) with the other three removed to make way for a banner honoring Final Four appearances by the Georgetown Hoyas. The Washington City Paper had called them "embarrassing," a 2005 ESPN.com article by Todd Wright commented, "It's time to lose those Mystics attendance banners hanging from the rafters"; the Sports Road Trip website mocked the banners by stating "Oh... Mystics... WNBA 'attendance champions' in '98 and '99. Wheeeee!" When The Washington Post writer Jon Gallo was asked about the banners, he stated, "The attendance banners were largely achieved because the Mystics gave away approximately 30% of their tickets before Sheila Johnson took over the team. If the Mystics had made everyone pay for a ticket, then they would not have had the best attendance in the league." In the 2009 season, the Mystics once again led the WNBA in attendance at 11,338 per game; however, in an entry on his blog earlier that season, Ted Leonsis, whose Lincoln Holdings owns the Mystics, had promised that there will be no attendance banner for 2009 should the Mystics conclude the season with the attendance lead. On Leonsis' authorization, the final remaining attendance banners were removed from the Verizon Center rafters in 2010. On January 11, 2014, an NBA game at the Verizon Center between the Washington Wizards and the Houston Rockets was delayed a total of 57 minutes because a leak in the roof had made its way to center court. The first delay was 35 minutes, and occurred early in the second quarter, and the second delay was 22 minutes, and occurred at the beginning of the second half. Verizon Center staff hung a tarp from the ceiling to temporarily stop the leak from getting onto the court. The game was 3 hours and 18 minutes long, including stoppages. ^ Carrera, Katie (December 6, 2012). "Hershey Bears Play AHL Showcase at Verizon Center, Keeping Capitals Fans Entertained for One Night During NHL Lockout". ^ Bailey, W. Scott (December 6, 2002). "New S.A. Sports Firm Set to Play Pivotal Pole in Big NBA Projects". ^ "Verizon Center". Delon Hampton & Associates. Retrieved February 5, 2013. ^ Heath, Thomas (November 25, 2004). "On Hockey Nights, A Center of Inactivity". ^ a b Associated Press (January 7, 2006). "Name Change: MCI Center to be Verizon Center". 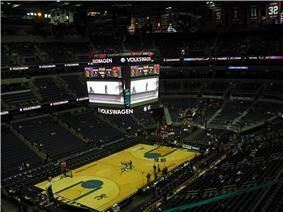 ^ """Verizon Center Shows off "First True Indoor HD LED Scoreboard. Engadget. September 28, 2007. Retrieved November 11, 2011. ^ Nakamura, David (December 2, 2007). "Verizon Center Marks 10th Anniversary". ^ "Verizon Center, Washington D.C.". ColosseoEAS. Jan 31, 2014. Retrieved April 29, 2014. ^ "1949-50 Washington Capitols Schedule and Results". Basketball Reference. Retrieved February 5, 2013. ^ Jackson, Lawrence (November 13, 2013). "ACC tournament will return to Verizon Center in 2016;". ^ "2011 Youth Rally and Mass for Life". Archdiocese of Washington. January 24, 2011. Retrieved February 5, 2013. ^ "Verizon Center Hits a High Mark 30 Million in Attendance". Washington Wizards. March 13, 2010. Retrieved January 9, 2014. ^ Gaynor, Michael (February 23, 2012). "Quick, Do the Ice!". ^ Fetters, Ashley (March 15, 2013). "Pink thrills Verizon Center with Spectacle and Songs". ^ Pacella, Megan. "Taylor Swift Red Tour Tickets Sell Out In Minutes". Web. Taste Of Country. Retrieved 16 February 2014. ^ Wetherbee, Brandon (February 11, 2013). "Beyoncé In D.C.: Pop Star Sells Out Verizon Center In Under A Minute". ^ Gustafson, Kyle (September 23, 2013). "Michael Buble Concert Review: Lots of Covers, Lots of Charm at Verizon Center". ^ Szadkowski, Joseph (November 19, 2013). "Sir Elton John at Washington's Verizon Center". ^ Kogod, Sarah (April 13, 2011). "Community Benefits From Fan Appetites". NBC 4 Washington. Retrieved March 5, 2014. ^ Weissman, Nicole (February 17, 2012). "Caps Care Casino Night Makes an Impression". Capitals Outsider. Retrieved February 26, 2014. ^ "MSE Foundation and the Washington Capitals Raise More Than $100,000 for Tragedy Assistance Program for Survivors Through 2012-13 Courage Caps Campaign". Washington Capitals. May 13, 2013. Retrieved February 11, 2014. ^ "Monumental Sports & Entertainment Foundation Donates $10,000 to NHL’s Thurgood Marshall College Fund". Washington Capitals. May 20, 2013. Retrieved February 6, 2014. ^ "Monumental Sports & Entertainment Staff Participate in Everybody Wins! DC Power Lunch Program". Washington Wizards. Retrieved March 5, 2014. ^ "2013 KaBOOM Playground Build". Washington Capitals. September 28, 2013. Retrieved February 11, 2014. ^ "Washington Capitals Defenseman Nate Schmidt and Alumnus Paul Mulvey Participate in Playworks Washington, D.C., Hockey Extravaganza". Washington Capitals. October 21, 2013. Retrieved February 12, 2014. ^ "Capitals Raise Nearly $40,000 During Hockey Fights Cancer Night". Washington Capitals. October 21, 2013. Retrieved February 12, 2014. ^ "Caps partner with puppies for non-profit canine calendar". ABC 7 News. October 15, 2013. Retrieved February 26, 2014. ^ "Wounded Warriors & Taps Families Attend Wizards Practice in Celebration of Courage Program and NBA Cares". Washington Wizards. Retrieved March 5, 2014. ^ "Give to Food 4 Families 2013". NBC 4 Washington. November 25, 2013. Retrieved March 6, 2014. ^ "Featured Video: Hoops For Youth Recap". Monumental Network. December 4, 2013. Retrieved February 26, 2014. ^ "Featured Video: Family-to-Family Recap Campaign". Monumental Network. Retrieved February 11, 2014. ^ "Featured Video: Corporate Engagement Award". Monumental Network. Retrieved February 12, 2014. ^ "Washington Capitals Braden Holtby Grants Wish of The Children’s Wish Foundation of Canada Child". Washington Capitals. January 13, 2014. Retrieved February 6, 2014. ^ "MSE Foundation MLK Day Project". Monumental Network. January 22, 2014. Retrieved February 6, 2014. ^ Steinberg, Dan (December 14, 2006). I Was Blessed:" The Goat Story""". ^ Steinberg, Dan (October 19, 2006). "The Horn Man Blows". ^ Yerdon, Joe (July 25, 2010). "ESPN Vendor Inspection: Caps' Verizon Center Dirtiest in NHL". ^ lavigne, Paula; Rovegno, Lindsay (July 25, 2010). "Vendor Inspection Reports". ^ a b Lowman, Stephen (January 28, 2009). "The Shrinking of Chinatown". ^ a b c Nakamura, David (July 1, 2011). "Wah Luck House Maintains Culture of Dying D.C. Chinatown". ^ Steinberg, Dan (February 10, 2009). "The Caps and Bad Ice: A History". ^ McKenna, Dave (June 30, 2006). "Cheap Seats: In With the Out: The Mystics Embrace Their Trustiest Fans". ^ "Venue Visitation: 107 and Counting". ^ "Washington Wizards". The Ultimate Sports Road Trip. Retrieved January 15, 2014. ^ Gallo, Jon (August 18, 2006). "Washington Mystics". ^ "WNBA Attendance: 09 Season Summary" (PDF). Womens Basketball Online. Retrieved January 15, 2014. ^ Leonsis, Ted (July 13, 2009). "Mystics Lead WNBA in Attendance After First Report". Ted's Take. Retrieved January 15, 2014. ^ Leonsis, Ted (May 7, 2010). "Washington Mystics Attendance Banners". Ted's Take. Retrieved January 15, 2014. ^ a b Dubroff, Rich (January 11, 2014). "Notebook: Rockets 114, Wizards 107". National Basketball Association. Retrieved January 11, 2014. ^ White, Joseph (January 11, 2014). "NBA Rain Delay as Rockets Top Wizards 114-107". Sports venues in Washington, D.C.